Editor's Note: Jewel is being chartered for the 2017 sailing season. 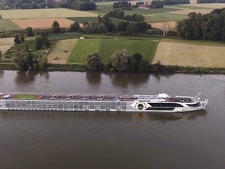 Jewel -- like the near-identical Emerald, Sapphire and Treasures -- is part of a series of the first ships ever built to the specifications of upmarket tour company Tauck. Onboard, the ambience is distinctively unique. Jewel, with its dark wood paneled atrium, surprisingly wide hallways for a riverboat and generous public spaces, is more evocative of a grand American hotel, like Colorado's Broadmoor or West Virginia's Greenbrier, than its more utilitarian competitors (whose decors often feel Hyatt-esque). The ambience may be elegant, but it's also comfortable, with plenty of spaces in which to recline -- from the lounge and the library to the very comfortable and spacious staterooms. Service, from Jewel's U.S.-based tour directors to its mostly Indonesian crew (some staffers hail from Eastern and Western Europe), is superb. It's pampering, intuitive and warm. Tauck also exceeded expectations when it came to onboard enrichment and entertainment, all aimed at a very inquisitive and well-traveled passenger. There's nightly piano music and usually some kind of post-dinner event, like a performance by Slovakian folk dancers. The glorious evening we spent at a Viennese palace for dinner and classic entertainment was the most unique and special night I've ever spent on a Danube River cruise. 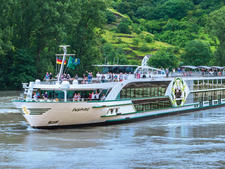 There are lectures on history and culture of places along the river, and the occasional special culinary event, such as a wine tasting with Austrian cheese one afternoon while cruising between Vienna and Bratislava. 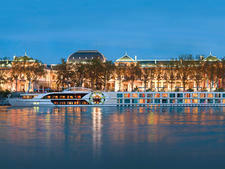 Tours, as they are on most riverboats, are included in cruise fares, and though the beloved "Vox Boxes" are provided (so that all can hear their guides without necessarily being close by), passengers are divided into intimate groups. There weren't any recreationally minded tours on our trip, but the ship does have bicycles that are available, free of charge, to passengers who wish to ride independently. The highlight of the cruise for many of us was the Tauck tradition of "lagniappe." Company founder Arthur Tauck put this New Orleans term for a surprising treat into play, and his legacy endures beautifully. 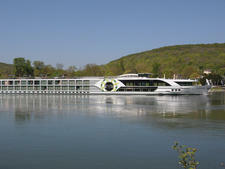 On our Jewel cruise, examples of lagniappes included a coffee klatch in a famous Bratislava cafe, a walking tour of Vienna's famous Naschmarkt led by the chef (and featuring tasting stops that range from wine to meats and cheeses) and, while cruising along the Danube one afternoon, a tasting of regional apricot liqueurs and chocolates. For passengers, the lagniappe is a surprise -- which adds to the appeal. 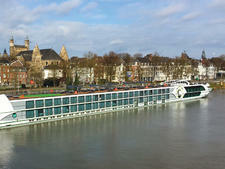 A few times, passengers spoke about how Tauck tours in general, and, more specifically, its river cruises, cost more than those of other river cruise lines (and tour operators). But there wasn't a soul who begrudged the expense; in true value-for-money fashion, discerning travelers got their money's worth, in spades. 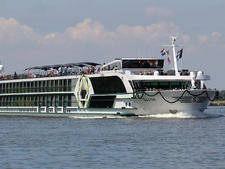 Tauck's core riverboat audience is well-traveled and well-heeled, in the 55-plus age range. A good number of the travelers on our sailing were repeat Tauck customers, though many were trying the riverboat experience for the first time, having done only the company's land tours. 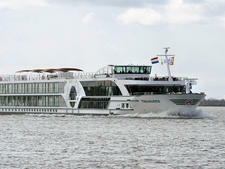 Those with prior cruise experience had generally sailed on luxury lines such as Seabourn, Silversea Cruises and Crystal Cruises. Casual attire prevails, at least during the daytime. But do note that casual for Tauck trips is still a bit dressy. Few, for instance, wore shorts either onboard or onshore, though all dressed comfortably. At night, women wore festive pants combos or casual dresses. Most men donned jackets, though few wore ties. The only rather formal night is the captain's farewell dinner; in this case, suits and ties for men and cocktail attire for women were the norm. 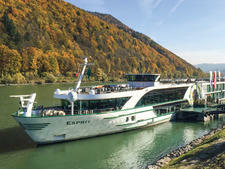 Tips are not expected, as Tauck's tour prices include gratuities for ship staff (and hotel staff if there's a land stay), local guides, drivers, Tauck directors and the cruise director. If you'd like to give a little extra, be sure to carry some cash, as you won't be able to charge tips to your onboard account.